Hakuoki: Stories of the Shinsengumi is coming to the US for the PS3 sometime in the future. Dating sims are a niche, especially otome games, ones directed at a female audience. 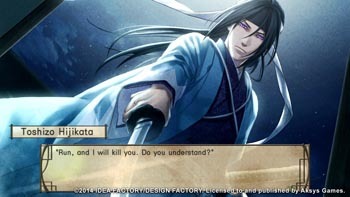 Hakuoki, one of the few otome dating sims brought over to the west, has two localized games already: the first, Hakuoki: Demon of the Fleeting Blossom for PSP and the second, Hakuoki: Memories of the Shinsengumi for 3DS. Aksys Games will localize a third, called Hakuoki: Stories of the Shinsengumi. However, all three games have roughly the same story with slight nuances for different ports. With Demon of the Fleeting Blossom being the baseline, Memories of the Shinsengumi -- released for North America last month -- added six side tales. The upcoming PS3 title has "roughly 20 hours" of additional content that are unlocked after playing through the main game. It also has the same story from the first localized game, and it adds a series of short stories that take place in a modern-day Japanese high school. Aksys also stated downloadable content side stories will be available as well. Aksys seems like it is cashing into Hakuoki in the west by releasing the same main story three times, but at least the upcoming game could be considered two games in one - both Demon of the Fleeting Blossom and Stories of the Shinsengumi. In the main story, Chizuru Yukimura travels to Kyoto in search of her disappeared father. Upon arriving in Kyoto, a group of demons clad in the traditional blue haori (kimono-like coats) attack Chizuru, and the Shinsengumi save her. Chizuru witnesses the Shinsengumi fight with other factions during the decline of the samurai. The player acts as Chizuru and forges relationships with the main characters, based on prominent members of the group. Aksys has shown it's committed to bringing over Japanese games that may not be picked up by any other company. Otome games have a weak market in the US compared to Japan, but the main way to show interest in future dating sims is by flashing some cash to the ones already here.